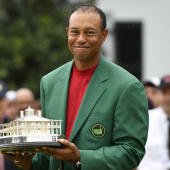 The 2019 Masters has provided a championship helping of highlights through just 54 holes, from Brooks Koepka's brilliant Thursday to the many twists and turns at the top of the leaderboard on Friday and then record-setting scoring performances on Saturday. Now, it's all going to have to come to an end quickly on Sunday due to inclement weather. Follow Round 4 of the 2019 Masters live with our leaderboard scoring updates. That kind of quick rally is going to be a challenge for the golfers at the top of the leaderboard who finished their rounds in the early evening, facing wake-up times as early as 4 a.m. ET in order to get through their warm-up routine in time for the rushed start. It's the first time the Masters has ever going with two-tee starts on Sunday, but the star power in contention promises that the non-traditional finish will produce a worthy winner. Here's how the leaderboard looks heading into Sunday morning's final round. 1. Francesco Molinari (-13): The world will be waking up early on Sunday to see whether Tiger Woods can win a fifth green jacket, but just like at The Open last year, it could Molinari that emerges as the winner from that group. The key to Molinari's success has been one of the most important aspects to winning at Augusta National: avoiding the big number. But even beyond avoiding a "big" number, Molinari has avoided negative scores almost entirely with only a single bogey through 54 holes of competition. T2. Tiger Woods (-11): The key to noting what Tiger is doing right now is that it's not "vintage Tiger." What we are witnessing is one of the 15 best golfers in the game in 2019 elevating his level of play on the biggest stage, and he just so happens to already have four green jackets to his name. Tiger has rebuilt himself for this final run in his early 40s, and it was all for opportunities like Sunday: to be in the mix to win another major championship. T2. Tony Finau (-11): Few things in golf right now are more exciting than Finau on a heater. Seeking his first-ever major and first-ever Masters win, Finau came out firing with three straight birdies on 1, 2 and 3. He then followed that up with another birdie on the par-3 6th and an eagle on the par-5 8th for the best nine-hole performance we've seen so far this year (30). Finau's final total was six birdies, an eagle and no bogeys for one of the three 64s on the board on Saturday. 4. Brooks Koepka (-10): It was a pretty solid round of 69 for the three-time major champion, only marred by a few mistakes that prevented him from going low. At 10-under he's absolutely in the mix to win, needing only to drown out the Tiger roars the same way he did at the PGA Championship last August. T5. Webb Simpson (-9): The soft, humid conditions played right into Webb's hands, and the experience of his previous Masters appearances has provided the blueprint for him to be successful. After making the weekend last year, Simpson knows exactly where to hit it, where not to hit it and when he can be aggressive. All of it set up for him taking part in the historic run of 64s. T5. Ian Poulter (-9): Riding alongside Tiger, Poulter's equally impressive 68 fell below the fold a little, but his effort should not be lost on fans taking a look at the leaderboard. The strange settings of a two-tee, earlier start could produce strange results, and Poulter is a world-class player who could take advantage and emerge as the unlikely winner. T7. Matt Kuchar, Justin Harding, Xander Schauffele, Louis Oosthuizen, Dustin Johnson (-8): A mixed bag here with Kuchar going low to join the crowded group just inside the top 10 while Oosty, D.J. and Xander had to grind a little bit for their scores just under par. The way Molinari pushed the lead out late in the afternoon doesn't benefit any of the players at 8-under, but none should be considered totally eliminated from contention.